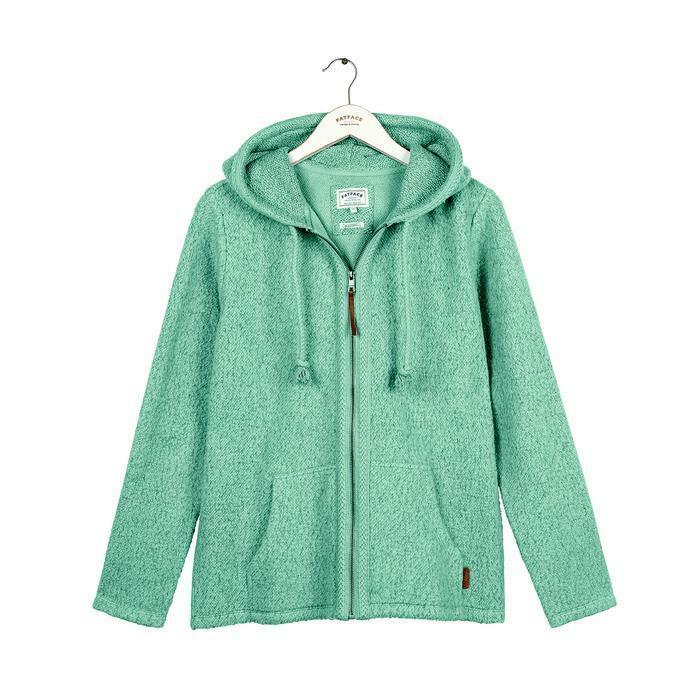 FatFace Corp., of Wilmington, Del., is recalling about 400 women’s overhead and zip-up sweaters. The garments fail to meet federal flammability standards for clothing textiles, posing a risk of burn injuries. The firm has received one report of a burn injury. This recall involves two styles of FatFace women’s sweaters: overhead Cowes (style number 918043) and zip-up (style number 918041). The style numbers are printed on a care label on the inside seam of the sweaters. The Overhead Cowes sweater is 97% cotton and 3% polyester sold in ivory. This sweater has a 3.5-inch cowl or funnel neckline that can be tightened or loosened by the drawstring located at the center front of the neckline. These sweaters also have a kangaroo-style pocket located at the bottom front of the sweater. The zip-up sweater is 97% cotton and 3% polyester with a Yarmouth textured zip-up sweater. It sold in ivory, ocean surf (green) and lilac ice (lavender). The sweater has a hood that can be tightened and loosened with a drawstring and a silver metal zipper extending from the neckline to the bottom of the sweaters with two pockets on each side of the zipper. The sweaters, manufactured in China, were sold exclusively at FatFace stores in Maine, Massachusetts and Rhode Island and online at www.fatface.com from September 2016, through January 2017, for about $60. Consumers should immediately stop using the recalled sweaters and contact the firm for instructions on returning the sweaters for a $75 refund. Consumers may contact FatFace at 800-585-0178 from 4 a.m. to 12:30 p.m. (ET) Monday through Friday, 5 a.m. to 1 p.m. ((ET) Saturday and 6 a.m. to 12 p.m. (ET) on Sunday, by email at usproductqueries@fatface.com with “Product Recall” as the email subject or online at http://us.fatface.com and click on the “Recall Notices” tab for more information.